Y is for (Marguerite d') Youville. 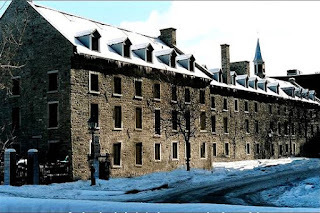 Inspired by Donna Pointkouski's post earlier this week (X is for Xavier), in which she writes about St. Francis Xavier, I decided to post a brief biography about Marguerite d'Youville, the first saint born in Canada. Born Marie-Marguerite Dufrost de Lajemmerais on 15 October 1701 in Varennes, Quebec, Marguerite (as she was known) came from distinguished stock. Her father Christophe du Frost, sieur de la Gesmerays (La Jemmerais), was originally from Brittany, France. An officer, he reached the rank of captain the same year his daughter Marguerite was born. Her mother Marie-Renée Gauthier was a co-heiress of the Varennes seigneurie, owned by her father René Gauthier, sieur de Varennes, the governor of Trois-Rivières. After a failed engagement to a young nobleman, Marguerite married François You on 22 August 1722 in Notre-Dame church in Montreal. François, also known as Youville de la Découverte or simply Youville, was the son of Pierre You, a companion of Robert Cavelier, sieur de La Salle. Pierre was with the famous explorer when he claimed the Mississippi basin (Louisiana) for the French king in 1682. After her husband's death, Marguerite chose to move forward with her life and be of service to others. Soon, she and three women formed a little group to help the poor of Montreal. New France of the 1730s didn't have provisions or social programs to care for women who were elderly, infirm, widowed, or without family support. In December 1737, Marguerite and her companions formalised their arrangement by forming a lay community dedicated to Christ and to serving anyone in need. After years of caring for the poor and disadvantaged, Marguerite and her group received royal permission to found a new religious order in June 1753: the Order of Sisters of Charity of Montreal. Marguerite was the Order's first superior. The call to the religious life was strong in Marguerite's family. Two of her brothers, Charles and Joseph, as well as a maternal uncle, became priests. One of her mother's sisters joined the Ursuline nuns in Quebec City. Later, Marguerite's own sons François and Charles joined the priesthood. Marguerite and her religious sisters, known as the Grey Nuns, did not live a cloistered life in Montreal. They were active in their community and accepted anyone at their door, at first in their modest rented house, and later at the Hôpital Général, when they took over its management in 1747. (Note that Marguerite's hospital should not be confused with Montreal General Hospital, which was founded in 1819.) The sisters went where they were needed, whether it was the local home of someone afflicted with smallpox or further afield in Oka, some distance away, to care for the Aboriginals. Grey Nuns' Hospital in 2009. Photo source: Wikipedia contributors, "Grey Nuns' Hospital," Wikipedia, The Free Encyclopedia, (http://en.wikipedia.org/w/index.php?title=Grey_Nuns%27_Hospital&oldid=515189623 : accessed October 26, 2012). After years of devoted service to her Order, Marguerite's life drew to a close. She died after suffering a stroke on 23 December 1771 in Montreal at the Hospital where she had worked with charity, dedication, skill and courage. Marguerite's path to sainthood began in April 1890 when Pope Leon XIII declared her Venerable. Later, in May 1959, Pope John XXIII beatified Marguerite; she was now Blessed. On 9 December 1990, she was canonised by Pope John Paul II; she was now Saint Marguerite. Her feast day is celebrated on October 16. Marguerite's tomb rests in a chapel dedicated to her in Saint-Anne Basilica in Varennes, her birthplace. While preparing the biography of this remarkable woman, it occurred to me that some of my ancestors might have been patients in Marguerite's Hôpital Général. I did a quick search and found a candidate: Barbe Pilet, widow of Toussaint Raymond dit Passe-Campagne, my paternal ancestors. Barbe, born in 1667 in Boucherville, Quebec, died on 2 January 1757 at the Hôpital Général in Montreal. She was buried there the next day. 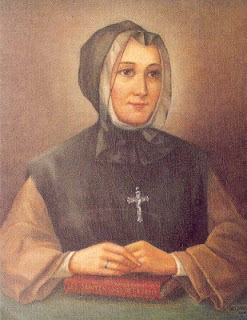 Now that I know that Barbe was taken care of by the Sisters of Charity, it's tempting to imagine that Saint Marguerite d'Youville herself might have given comfort to my ancestress. For more information about Saint Marguerite d'Youville, visit les Soeur Grises de Montréal. To read what other bloggers have written throughout this A to Z challenge, take a look at Family History Through the Alphabet. That's awesome, Yvonne! I was not familiar with her story, so I'm really glad you shared it. I'm thrilled, Donna, that you liked my story about Saint Marguerite. I'm definitely glad I chose to write about her. The more I read about her life, the more I realized how concerned she was for all manner of folk - the poor, the hungry, the ill, the orphan. She reminds me of an 18th century Mother Teresa. Thank you for this fascinating profile. I knew nothing about Saint Marguerite and this aspect of Canadian history. Saint Marguerite is certainly an inspiring woman, Sue; she was a great subject to research. That is a such a beautiful story. And no doubt Marguerite and the Grey Nuns had an amazing affect on so many throughout their lives. And to find you have an actual connection to the her hospital just adds to it! Thanks so much for your comment, Alona! It's thrilling to know that one of my ancestors was cared for by Saint Marguerite's sisters. A blessed and happy Easter, everyone! Joyeuses Pâques, tout le monde! Copyright © 2019, Yvonne Demoskoff.